If you’re planning a trip to Disney World, it’s probably no surprise to you that it can get, well, crowded. 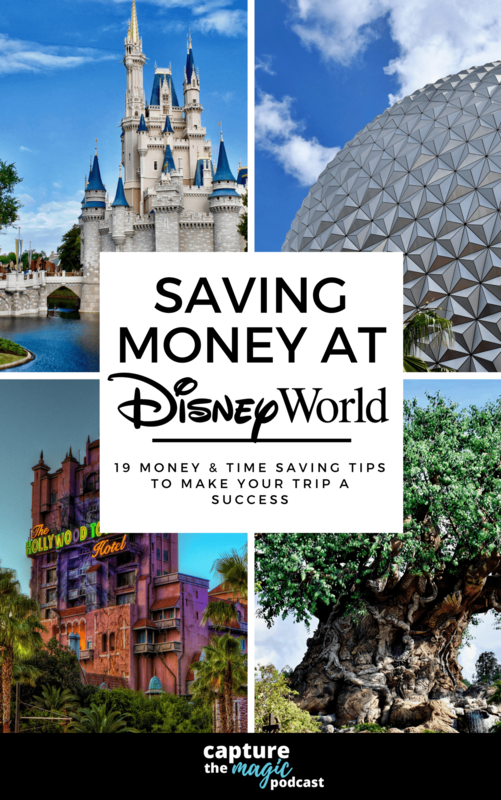 Millions of people all over the world every year head to The Happiest Place On Earth, but if you plan your trip just right you can avoid some of the busiest times in the parks. That’s why we have put together our Disney World Crowd Calendar for 2018 and 2019! Let us say first that there are a lot of variables that go into creating our Disney World crowd calendar, and these are our predictions based on annual trends, events, festivals, and even world wide economic variables. WDW can be a pretty unpredictable place sometimes, as people from all over the world head there so if you go based on some of these dates that aren’t as busy and it turns out to be busy, we’re sorry! We promise we did our best! When Do We Recommend Going? If you just want to bypass all the complexities that can be a Disney World Crowd Calendar and just want to cut to the chase about when we recommend going, then you can check out this episode of our podcast where we talk about just that – the best and worst times to go to The Happiest Place on Earth..
We will break our crowd calendar up by months to make it as simple as possible for you to get the info you need for when you are thinking about going. 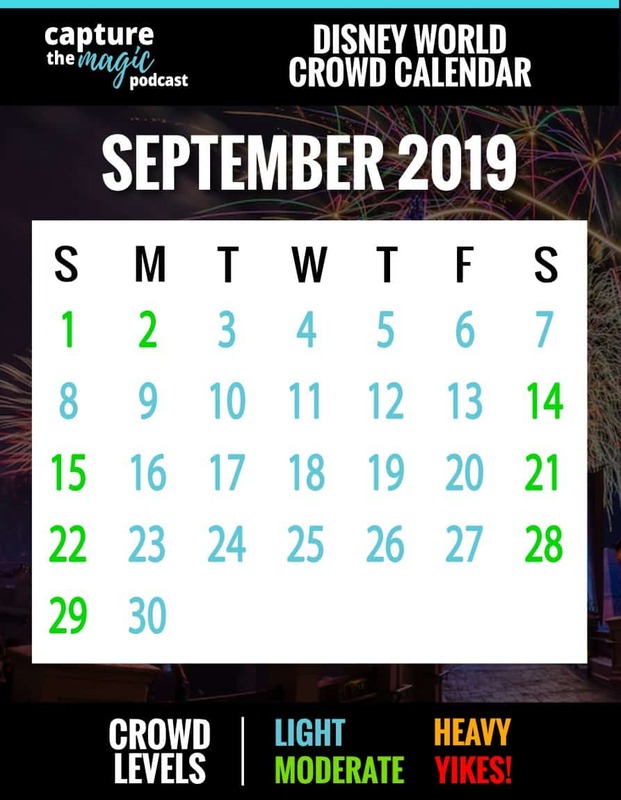 Coming off the crowded summer months, the September Disney World crowd calendar is a time where the parks get a little reprieve. 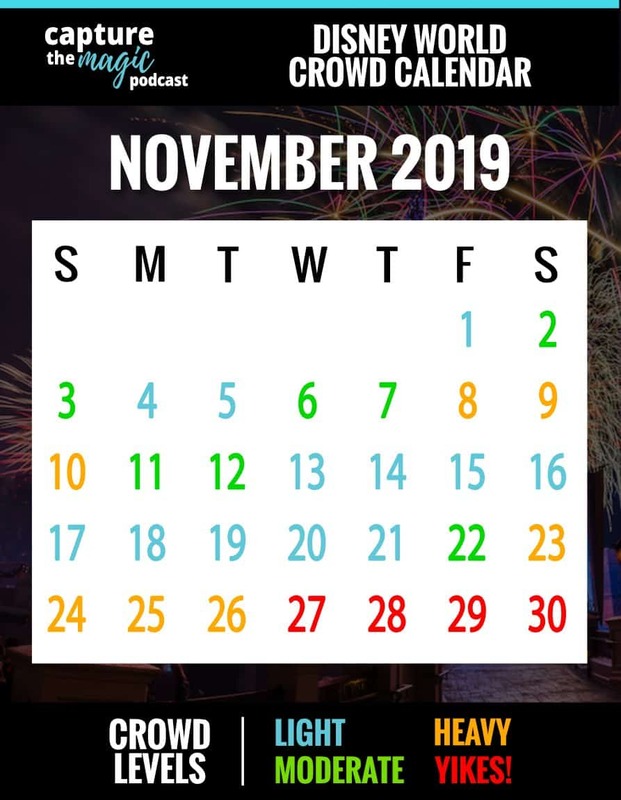 We say a little, mostly because the Disney World crowd calendar the last few years has shown that Disney has done a very good job filling this month with special events to draw guests in. While kids are now back in school, Epcot’s International Food & Wine Festival and Mickey’s Not So Scary Halloween Party start at the end of August and are in full swing, drawing big crowds to EPCOT and Magic Kingdom. Regardless of those events, September remains an ideal time to visit. The Fall decorations alone are worth a trip this month. This time of year used to be a slow time at Disney World, but that’s not the case as much anymore. 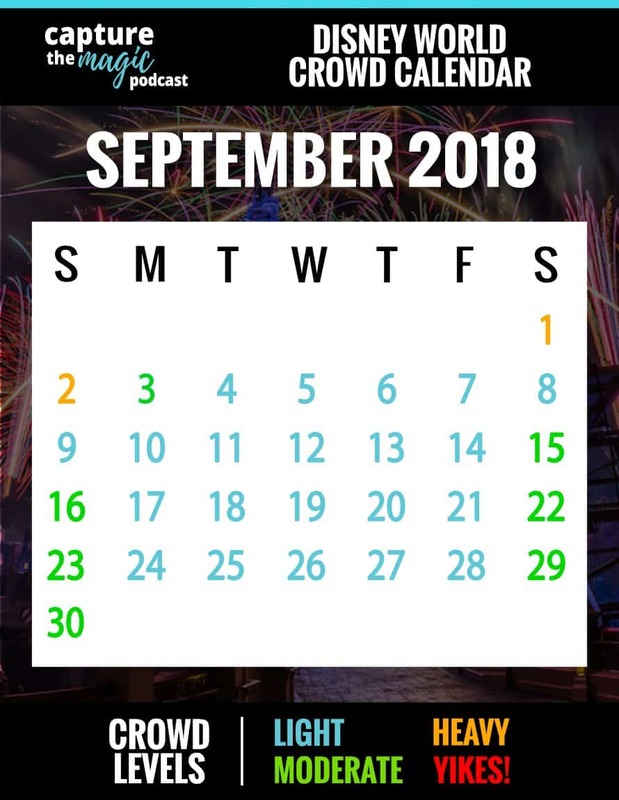 The crowd calendar tells us the people coming to “The World” are less than they are in the summer for sure, but with Food & Wine and Halloween parties in full swing, more people will make their way to the parks. More schools across the country have implemented Fall Breaks into their school year (usually the 2nd or 3rd week in October), giving opportunities for families to travel more easily without missing school. You’ve also got Columbus Day on the weekend of the 6th that will draw more crowds. 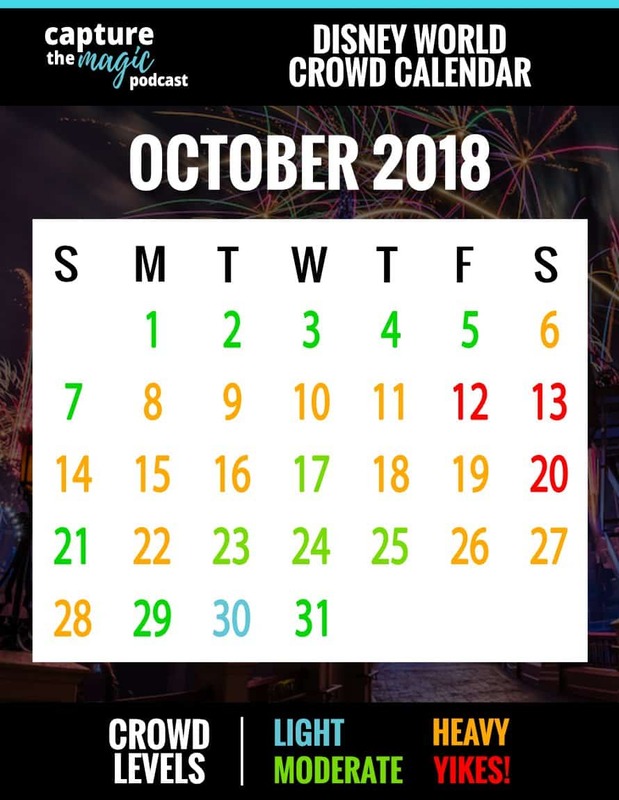 So if you’re going to go in October, it’s recommended to go the first few days of October or more towards the end of the month, as crowds typically lessen toward the end of October when we look at the crowd calendar. Keep in mind that Epcot will get really busy during the Food & Wine Festival on the weekends, as it’s a favorite of locals. The November crowd calendar signals the beginning of Christmas, making this month one of our favorite times to visit. If you’ve never experienced it, you really should. The parks are festive, fun and truly magical during this time of year. It used to be the early part of November was a great time to head to the parks as they had low crowd levels, but that is not the case anymore, with the Wine & Dine marathon the first weekend of the month and many schools in New Jersey having time off around the 6th – 12th, also known as “Jersey Week”. Any holiday is always busy and Thanksgiving is no different. Guests will start heading to the parks around the 17th, but crowds will be very heavy from the 22nd – 25th. Some lower attendence levels during this time can be the 13th-16th and the week after Thanksgiving will usually see crowds taper off according to our crowd calendar. The December Disney World crowd calendar is the start to our favorite time of year to visit, with Christmas in full swing. You’ll see the parks in ways you never will any other time of the year. It’s actually not bad the early part of the month, according to our crowd calendar. There are some Pop Warner events going on that will bring some crowds in, but nothing bad. As it gets closer to Christmas, the crowd calendar shows the attendance levels increase quickly. The week of Christmas the crowds are, well… nuts! If you’re going during this time you can expect the Magic Kingdom to close due to capacity at least a few times (ya, it’s that busy). This is a great time to go, but our recommendation is to go in the first part of the month before the Christmas crowds come in full force when looking at the crowd calendar duirng this time. Starting off the new year on our Disney crowd calendar, you can see a drastic swing in crowd calendar attendance levels during this month. The beginning of January will still see higher levels according to the crowd calendar, as schools are on still on Winter Break and people are still there from Christmas. There is marathon weekend the 9th-13th that will see thousands of people descend onto the parks for this event. The 14th-18th and the 22nd-31st can see very low crowd levels, in fact, you will find some of the lowest levels of park goers according to our crowd calendear for the year when looking at the Janurary crowd calendar. Martin Luther King Day tends to bring in some decent crowds during the 19th-21st so keep that in mind. There is also the International Festival of the Arts that continues to see more dates added and is becoming another popular festival at Epcot. This could also mean January will become busier in the coming years due to this festival so in the future the crowd calendar could show some different levels. 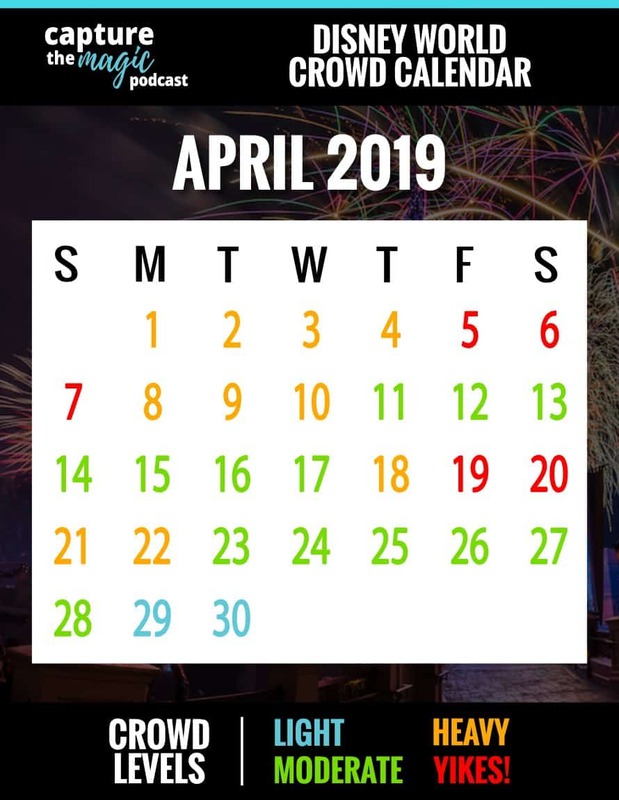 This month at the crowd calendar shows the very beginning of the month will see a slight increase in crowds due to the National Dance Team Championships and again from the 9th-10th. The crowds according to the crowd calendar will be light between and after the dance events until crowds start showing back up for President’s Day weekend around the 15th. You also have the Princess Half Marathon after President’s Day, making the time period from the 16th-25th anywhere from moderate to very busy. The rest of the crowd calendar this month you will see lighter crowds. Our crowd calendar says this month is a busy month at Disney World with Mardi Gras, dance and cheer competitions and, of course, Spring Break. There is also the Epcot Flower and Garden Festival going on during this time which according to our crowd calendar is going to bring in crowds, especially on the weekends, as locals make their way to Epcot during the festivals. You can basically count on high crowd levels up until the 25th and then the rest of the month is actually lower crowd levels according to the crowd calendar. 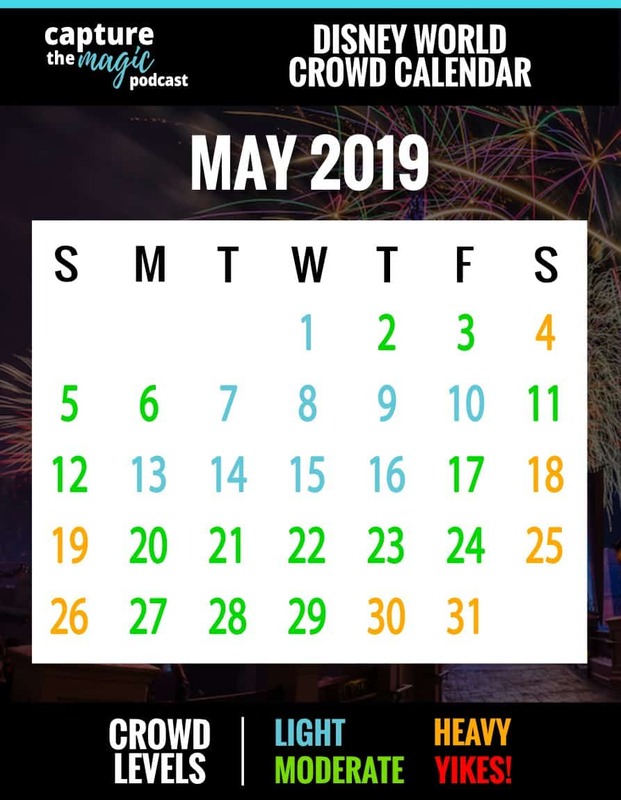 According to the April crowd calendar, you can see a mixture of crowd levels from low-moderate and then up to very high due to Easter (any holiday at Disney World is busy). The first few days of the crowd calendar this month have pretty low levels according to our crowd calendar, but you’ve got the Star Wars Marathon from the 4th-8th that bring in heavier crowds. Starting around the 13th, there is more Spring Break crowds making their way to the parks, and then you have the Easter (April 21st) crowds and more dance competitions, basically making it busy to moderately busy the rest of the month. May is probably our second favorite time to go to the parks after Christmas, but it’s our top pick in terms of crowd levels according to our crowd calendar. Most of the month is pretty low crowd levels, even with some dance competitions sprinkled in during that time. Looking at events on the May crowd calendar you’ve still got the Flower and Garden Festival going on, the weather is usually not too hot, and the parks just have that feel of Spring in the air. This also marks the last time you will see low crowds until September because once Memorial Day weekend hits, schools start letting out and the summer crowds start coming in more heavily. This used to be a much busier time in years past, but for the last few years, the June crowd calendar hasn’t seen the higher crowd levels it once did. It’s still a busier time of year compared to, say, May, but for summer crowds, it’s not awful. No festivals going on or big events, so if you are planning to go in the Summer, June isn’t a bad time to go according to our calendar. The July crowd calendar shows overall crowds aren’t as high in the Summer as they used to be. It could be that people started planning their trips in “off-peak” times to avoid the crazy crowds, but the exception to this is July 4th holiday. This is peak summer crowd levels, as Disney World puts on an amazing fireworks show on the 3rd and 4th to celebrate America’s Independence Day. Before the 3rd and after the 7th, the crowds will go back to being busy to moderately busy for the most part. At this time the Summer calendar is beginning to wind down but the crowd levels won’t reflect this until more toward the middle of the month as that’s when some school districts start going back to school. It is very hot during this time so while you may have some lower crowd levels toward the middle to end of the month according to the crowd calendar, you can expect to sweat buckets, so be sure to drink plenty of water. You also have the Food & Wine Festival and Mickey’s Not So Scary Halloween Party kicking off in August. 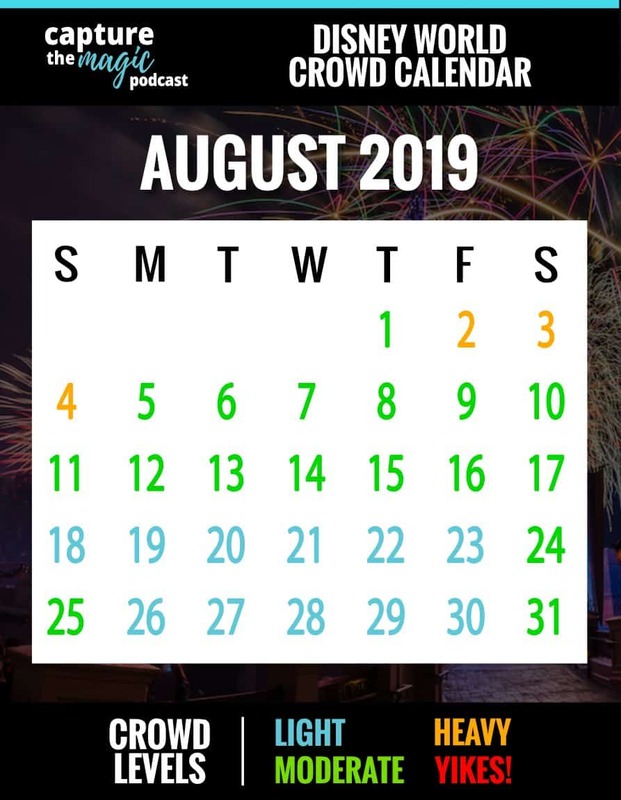 The crowd calendar shows that people heading to “The World” will start really thinning out in September as kids have all started going back to school, making it one of the ideal times to head to Disney World. Epcot’s Food & Wine Festival starts this month’s activities calendar off, Mickey’s Not So Scary Halloween Party dates are also in full swing along with the amazing Fall decorations at the Magic Kingdom. This is our 3rd favorite time to head to the parks. We’ve noticed a shift in our crowd calendar over the years as this time of year used to be slow but that’s not the case as much anymore. The crowds are less than they are in the summer for sure but with Food & Wine and Halloween in full swing, more people will make their way to the parks. You’ve got Columbus Day weekend on the weekend of the 6th that will draw more crowds so if you’re going to go in October it’s recommended to go the first few days of October or more towards the end of the month as crowds typically lessen toward the end of October’s calendar. Keep in mind that Epcot will get really busy during the Food & Wine Festival on the weekends as it’s a favorite of locals. The November crowd calendar begins possibly our favorite time to visit because it means it’s the beginning of Christmas in the parks. If you’ve never experienced it, you really should. The parks are festive, fun and truly magical during this time of year. It used to be the early part of November was a great time to head to the parks as they had low crowd levels but now with the Wine & Dine marathon at the beginning of the month and many schools in New Jersey have time off around the 6th – 12th, also known as “Jersey Week” in many circles. 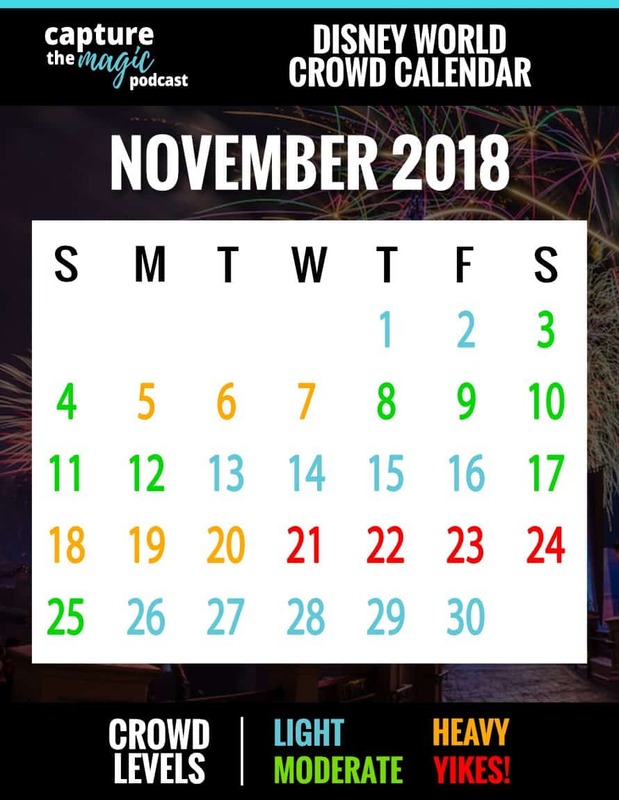 Any holiday is always busy and Thanksgiving is no different as according to our crowd calendar crowds will start heading to the parks around the 17th but crowds will be very heavy from the 22nd – 25th. Some lower crowd levels during this time can be the 13th-16th and the week after Thanksgiving the calendar usually sees crowds taper off. This is our favorite time of year to go as Christmas is in full swing and you’ll see the parks in ways you never will any other time of the year. It’s actually not bad the early part of the month crowd wise according to our crowd calendar. There are some Pop Warner events going on that will bring some crowds in but nothing bad. As it gets closer to Christmas the calendar shows crowd levels increase quickly. The week of Christmas the crowds are, well… nuts! If you’re going during this time you can expect the Magic Kingdom to close due to capacity at least a few times (ya, it’s that busy). This is a great time to go but our recommendation is to go in the first part of the month before the Christmas crowds come in full force. Note: It’s been announced that Star Wars: Galaxy’s Edge is set to open “Late Fall 2019. ” The rumor is that this probably means late November/early December. When it does open, our crowd calendar will be adjusted to fit the insanity of the high crowds that this new land will bring. Hopefully, our crowd calendar helped give you a good idea about crowd levels while you’re planning your vacation. While it’s easy to obsess over crowd levels, the best time to go calendars and of course your own personal calendar. We always say try to plan your trip based on ideal times when it’s possible but the truth is that the best time to go is the time that works best for you and your family. Crowds can change our calendars and it’s impossible to know exactly when it’s going to be slow or busy as there are so many factors that go into any crowd calendar analysis, especially in a place as large as WDW. So just go when it’s best for your family and have a great time! If you found our Disney World crowd calendar helpful and would like even more tips, tricks, and advice along with the latest news and rumors about “The Happiest Place On Earth”, then we invite you to check out the Capture The Magic Podcast. We have episodes two times per week along with our other shows, The Dis Dudes and Main Street Magic. We’ve got you totally covered when it comes to planning and enjoying a great vacation beyond just a stellar Disney World crowd calendar. If you’re looking for more than just a great Disney World crowd calendar, then you should be sure to check out other articles we’ve got on the site here, like our guide to the best Character Dining at Disney World. Also, be sure to check out our popular Disney vacation shirts line that is full of park inspired designs.